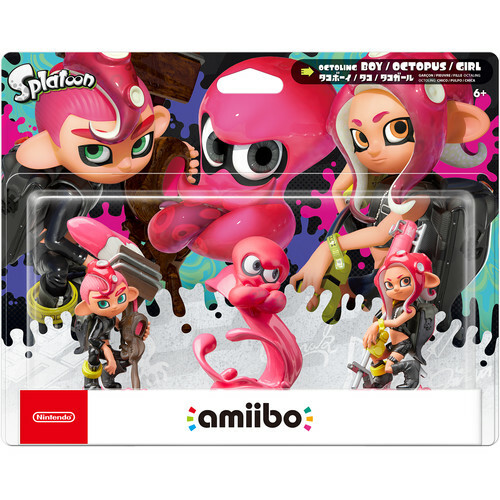 This pack of Octoling amiibo Figures from Nintendo includes three Octoling characters: Octoling Boy, Girl, and Octopus. The protagonist of the Splatoon 2: Octo Expansion DLC is a young Octarian Octoling, known as Agent 8. Octolings seem to have a more serious nature than the carefree Inklings we're accustomed to. They're naturally good with their hands and adept at using tools and machinery, making them quite formidable in battle. Like Inklings, they have the ability to transform, but into octopuses rather than squids.